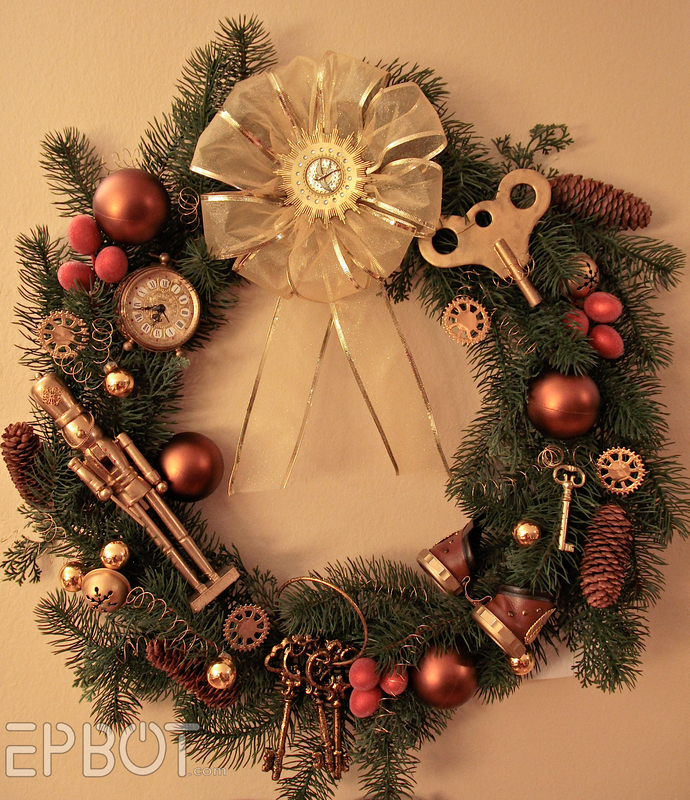 EPBOT: My Steampunk Christmas Wreath! I hope you aren't tired of my Christmas decorations yet, because I still have one or two surprises left! I'd hoped to show you my entire dining room today, but yesterday was pretty emotionally exhausting (if you read CW and/or the news then you know what I mean), so I'm afraid I didn't take the wide-angle shots last night like I planned. Instead I planted flowers by our front door and held onto John and tried to remind myself what real life feels like. I did it! 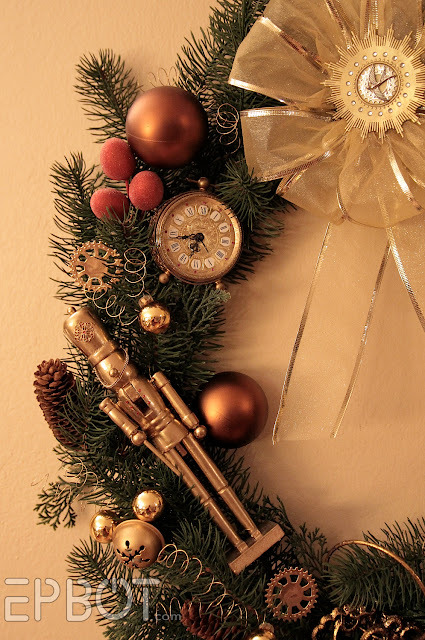 I made my steampunk wreath! There were a lot of different directions I could have gone for this wreath, and at one point I was planning to make two, because - as you know - Christmas makes me go a little crazy. Anyway, reality intervened, so I didn't get to the second one, which would have been copper and purple and hot-air-balloon themed. I still have plans for a more casual, hardware-store version, though, for every-day use next year. Anyway, for this one I started with a strand of garland and a wire wreath form, since I couldn't find a plain wreath I liked. (They all looked so cheap and fake.) My strand of garland made for a pretty sparse wreath, though, and it was three pains and a half to wire down, so in the future I'm definitely going with the pre-made ones. Anyone with cats knows this is how all crafting gets done. I collected all the items I thought I might possibly want to use - goggles, keys, clocks, ornaments, etc. - and began laying them out. Originally I wanted to use my copper nutcracker, but later decided an all-brass theme would be sparklier. I'm sure a lot of you recognize most of the big stuff I used, too, from John's goggles to the oversized key we made for our steampunk newborn shoot. The hardest lesson I learned with wreath-making is that you can't decorate it flat on a table, because when you pick it up everything will shift and move and generally not hang at ALL like you pictured. I had to re-wire almost everything when I picked mine up, since so many things moved or slipped. (URG.) In the future I'll hang it on the wall first and work on it vertically. After working all night on the wreath I stood back, looked it over, and hated it. It just seemed so clunky and disjointed. In despair I made up a bunch of brass wire curly sprigs (just bending wire around a chopstick) and also tucked in a few more of those die-cut gears I love so much. Somehow those two finishing touches brought the whole wreath together for me, and now I love it. The bow is the most rigged thing I've ever done, and you'd laugh if you could see the back side of it. Staples and wire GALORE. The bow center is something I made a while ago to become another steampunk medal, but I've yet to find a good ribbon for it. 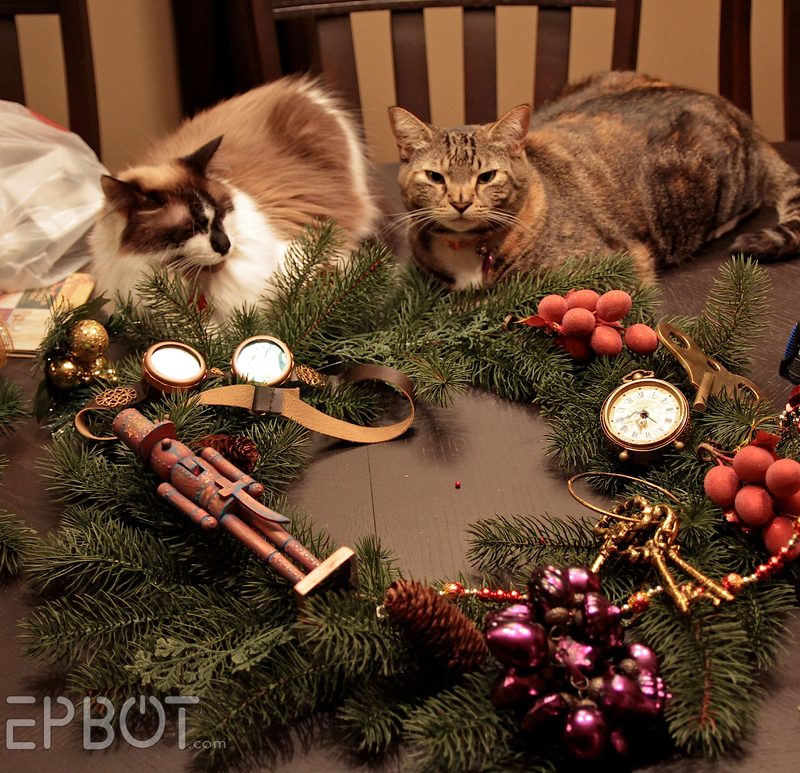 I think it makes a nice centerpiece for the wreath, though, don't you? K, that's my wreath! I hope you guys like it, and that you have an awesome weekend! Nicely done, Jen! You should totally make another one.... and give it away! WOW, it is really nice... you are very talented! Today I had a seven-year-old girl over at my house so she could wrap Christmas presents for her family while keeping their gifts a surprise. The moment - the moment! - the giftwrap was unrolled, Minerva the cat volunteered to hold it down for us. So which one is Tonks? And which is . . . I can't ever remember the name of your other one. I just remember Tonks once swallowed a bunch of ribbon and you had readers out the wazoo (so to speak) urging you to not take it lightly. You were so happy with the clock that this post from Crookedbrains made me think of you: http://www.crookedbrains.net/2012/12/creative-watches-unusual-watch-designs.html? The backs of wreaths are supposed to look a mess - that's why they have a back side. I tend to use both wire & hot glue when I do mine - keeps slippage to a minimum. I'll tip it up every so often as I go as well, to make sure it looks the same from the proper angle. 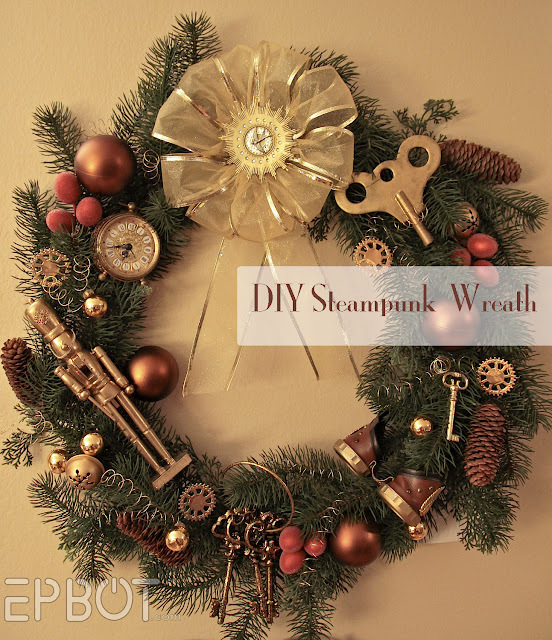 I love your steampunk wreath! After your nutcracker tutorial a couple weeks ago I was going to try my hand at it, but life got a little busy. 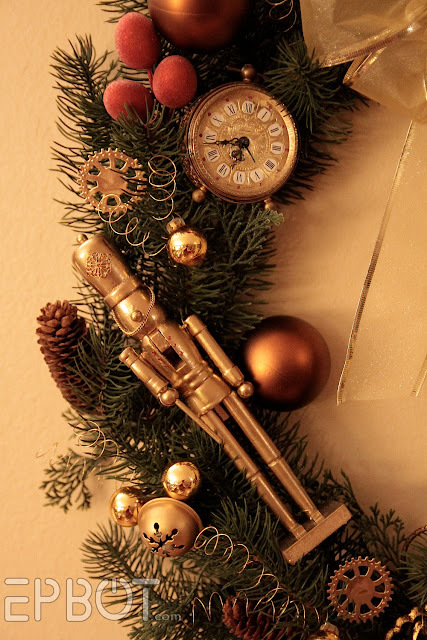 I still hope to try a copper or gold nutcracker before Christmas, but that may end up on next year's to-do list. Keep showing us your great work. I like gathering ideas for someday when time does work out to my advantage. Thanks, Jen: In the future I'll hang it on the wall first and work on it vertically. I'm doing my first non- bow and standard ornament wreath today so I'll definitely take your advice! My mother found paper mache veggies and an old, metal measuring spoon set and asked me to do a wreath for our pantry door! I am loving your Very Steampunk Christmas. Thanks so much for the pictures and tutorials. It's nice to have something pleasant to think about. When it comes to crafting I'm more ambitious than artsy, but wreaths are something I can do. I use the same sturdy metal wreath form every year, with cuttings from a local Christmas tree lot (they're happy to let me take them away for free - I usually end up with enough to also make a table centerpiece) and paddle wire to wrap the greens around the form. I just cut and lay the greens around the form in layers and wrap the wire around until it looks full. Then I add ornaments, pine cones from a tree in our neighborhood and some ribbon from my wrapping stash. It's a beautiful decoration that costs almost nothing after the initial first-year investment in a form, wire and ribbon. I encourage everyone to try it, artsy or not. We still don't have the Christmas tree out (our apartment is so small that we have to take the couch to the storage shed first), but I did take out the first box of Christmas decor. I hung up Mr. Haiku's childhood garland on the wall, put Uncle Drosselmeyer on a nutcracker-friendly bookcase, and pulled out Wreck the Halls, which I promptly read cover to cover again with glee. Thank you for writing it. If only you lived closer to me. Making those giant poofy florist bows is my favorite!